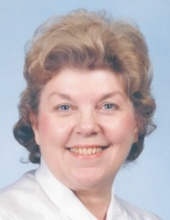 Judith "Judy" Anne Hein went to be with her Lord and Savior, passing away peacefully at home surrounded by her family on February 1, 2019. A celebration of life service will be held at 10:00 AM on Wednesday, February 6, 2019 at the Berean Church with Pastor Dan Holsten officiating. Services will conclude at the church. Judy was born in Clay Center, Kansas on July 22, 1937 to John and Leola (Woodhull) Munroe. Her family moved to Sterling when she was seven. During High School she was a proud member of the Columbine marching band when they traveled to Washington D.C. After graduating from Sterling High School in 1956 she worked at Good Samaritan Hospital and Logan County Hospital. She married Jack Hein September 30, 1961. Judy was also active in Jacks business Hein Construction. She helped with the bookkeeping and in the development of Pawnee Ridge Subdivision. Judy loved spending time with her family. She loved her flower gardens, especially loved her beautiful Iris and Roses. She loved watching for humming birds in the summer and had a love for all animals especially her cats. She is preceded in death by her parents, sister Maureen Sorensen and infant Great Grand Daughter Aaliyah Grace Kind. Judy is survived by husband Jack, daughters Jennifer (Doug) Crow and Virginia (Rob) Hoffmann. Granddaughter Lindsey(Calvin) Kind and Great grandchildren Madison and Toby Kind. Memorial contributions may be made in honor of Judy to the Berean Church in care of Tennant Funeral Home. P.O. Box 1547, Sterling Co 80751. To send flowers or a remembrance gift to the family of Judith "Judy" A. Hein, please visit our Tribute Store. "Email Address" would like to share the life celebration of Judith "Judy" A. Hein. Click on the "link" to go to share a favorite memory or leave a condolence message for the family.